Merry Christmas to all and to all a happy flag flying day! The stars and bars is great for any occasion, but the flagpole can become a real statement with a holiday flag or a custom flag. 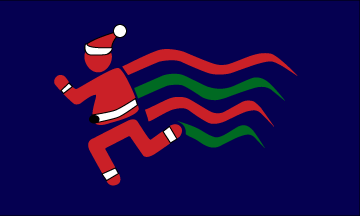 This year, we thought we'd share with you our holiday flag for the FlagRunners. The best messages on a flag are flown not with words, but with images. Santa Clause can be traced back to the 1820s. However, there is a Germanic Pagan tradition which draws very similar parallels. However, in recent years, the prospects of Santa have done wonders for the commercial and mercantile industries. The figure is not to be trifled with. The reward for a close identification with Santa can keep consumers' with a mind to gift giving on your brands and products. The symbolism of a man in a red suit speaks volumes over a slogan or statement. Famous examples include the Coca Cola Company. Being a bit flexible with your flag display can go a long way this holiday season. A time when giving overtakes criticism.